The Western has been one of Americas most durable and popular genres with origins that precede cinema. They are often easily identifiable, concerning themselves with heroic storylines, beautiful landscapes and Stetson sporting cowboys. However, over time the genre has transcended these elements, blanketing itself in different genres and finding new and exciting forms. Here are 5 Westerns that aren’t Westerns, that actually are Westerns. 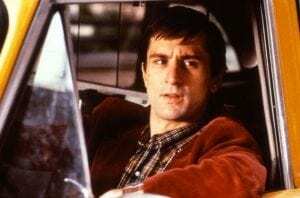 Enter Travis Bickle (Rober De Niro), Martin Scorsese’s antihero from Taxi Driver, a New York City cabbie, driving endless night shifts collecting fares and obsessing over the city’s squalor. Travis is a drifter, he sports red cowboy boots, jeans and the all too familiar gait of a man with no name passing through a town with no law. Like the Stetson wearing, gunslingers before him he’s got a military background (substitute the Civil War for Vietnam), a familiarity with violence and lives by a moral code (albeit one he continuously contradicts). 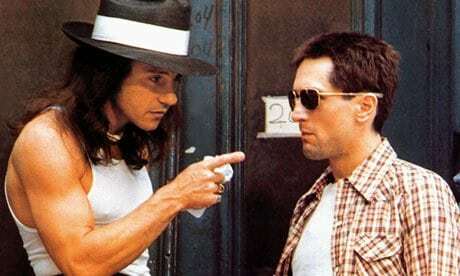 Paul Schrader, screenwriter, even went so far as to give De Niro’s character the same name as a defender of the Alamo. However, this is not all that makes Taxi Driver a great Neo-Western. In relocating the Wild West to the sleazy, lawless landscape of mid-1970s New York City, the film provides a contemporary take on the frontier mythology. Travis is firmly located in the “wilderness” of New York City. His exposure to this serves as the source of all his motivation. When faced with presidential candidate Senator Palentine, a smooth talking politician who speaks in platitudes, Travis is confronted with the failings of the “civilized” world and its inability to take necessary action. As a result Travis rejects this world. The film shares the same captivity/rescue narrative as John Ford’s The Searchers. Harvey Kietel’s pimp character, Sport, with his head band, long black hair and waist coat, works to fulfil a stitched together portrait of the “savages” that featured so prominently in the classic Westerns of the 1950s. In Travis’s decision to free teen prostitute Iris (Jodie Foster) from the clutches of Sport, Travis becomes the outlaw hero, and accepts his responsibility to take decisive action. Calvary opens to medium close up, single shot of Brendan Gleeson’s Father James Lavelle being threatened in confession that he will be killed in a weeks’ time. The man making the threat, abused as a child by a priest, feels that the killing of a good priest will have a bigger impact than the killing of a bad one. Less obviously so than The Guard, John Michael McDonagh’s film of three years previous, Calvary, remains a revisionist western at its core. Not dissimilar to High Noon, Calvary substitutes frontier violence for civic duty. Like the Marshall, Will Kane, Father James Lavelle wears his heroism inwardly. Abandoned by the people of his parish, he briefly considers abandoning them, but driven by his sense of duty and being a good man he takes it upon himself to carry the burden of guilt for his community. Whilst Calvary maintains some of the Western genre’s more conventional tropes, the rugged Irish landscape, specifically Benbulben Mountain, bear similarities to the breath taking landscape of the West, the film subverts, in many of the same ways High Noon does, the classic Western paradigm. John Michael McDonagh forces the audience to recognize Father James’s humanity and ultimately his belief in love, hope and forgiveness. 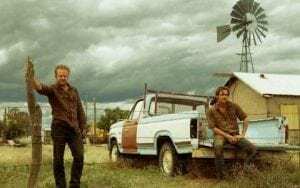 Hollywood’s summer heist-thriller, Hell or High Water, directed by David Mackenzie, is a tense, violent, elegiac Western in the vein of Coen brother’s No Country for Old Men. Brothers Toby (Chris Pine) and Tanner (Ben Foster) rob different branches of the same bank across West Texas, taking only low denomination notes, whilst Texas Rangers Marcus (Jess Bridges) and Alberto (Gil Birmingham) pursue them. There is a melancholy to this film in the way it treats it landscapes and characters, their motivation and morality. The West Texas world the characters inhabit is characterized by the vast empty landscapes and dusty towns with boarded up homes, businesses and signs of debt and financial instability. All this paints the picture of a world that is slowly fading into history. Hell or High Water positions the decay of the community and its moral framework down to the institutions that were meant to encourage the American Dream, the banks. As such a new breed of lawlessness has taken hold, one that exists beyond the understanding of the Stetson wearing “hero” Marcus. Jeff Bridges Ranger plays a similar role to that of Tommy Lee Jones in No Country, an older man who has seen the West change and a new wilderness grow, a residual survivor of time gone by, who is driven by the old school Western Manichean ethics of good versus evil. He does not understand the motivation behind Toby and Tanner’s actions, who rob banks to secure the future for Toby’s children. Marcus fails to understand the rational behind their actions. In his eyes they are “outlaws” even if there is an underlying morality to their robberies. Although Hell or High Water subverts the Western genre in Marcus’s inability to understand his outlaws, it does not with his desire to try to understand them. Upon his retirement, Marcus persists, which invokes the idea that perhaps although the times have changed and the world too, the drive for goodness has not. Dennis Hopper’s directorial debut, Easy Rider, which he also starred in, saw Hopper win a Best First Work award and a nomination for the Palme D’or at Cannes. Easy Rider captured the mood of a decade and helped bring about “New Hollywood,” and is about two bikers travelling from LA to New Orleans for Mardi Gras. Wyatt and Billy, appropriately named after two significant figures in both American history and mythology, fit the mould of the western character dynamic. Through thick and thin Wyatt and Billy rely on each other, they are bound together by the call of the open road and they reject the conformity of the civilized world. The feature that aligns Easy Rider most with the Western genre is the way it captures the American landscape. Laszlo Kovacs’ cinematography treats these spaces as beautiful and untouched, capturing the grandeur of the landscape. The rider’s encounters with farmers and a commune invoke a wholesomeness of the West. However as a hitchhiker tells them one night around a campfire; “the people this place belongs to are buried right under you,” a reminder of the history of Manifest Destiny. 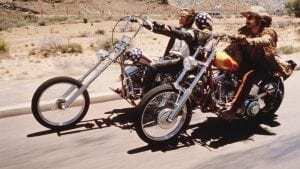 Easy Rider reverses the Western premise in the physical direction the characters travel, instead of moving East to West they go West to East. However, it sticks to Classical Western form, dealing with some of the typical themes of genre, freedom, masculinity and individuality. Billy and Wyatt dream of an unrestrained freedom and they idealise a memory of America. It plays on the mythology of the West, with the first half of the film, as they travel through the vast American landscape, painted as a happy and free world, full of beauty and promise. Only when they reach the small southern town and later New Orleans, spaces symbolic of the demise of the values they hold so dear, do they begin to suffer. This reinforces the traditional Western myth, and the direction of their journey gains relevance here. The east is slowly moving west and Billy and Wyatt are a dying breed who will eventually lose their place in this world. Dividing critics and audiences alike, American Sniper’s retelling of crack shot Navy Seals sniper Chris Kyle’s four tours in Iraq is part biography, part fiction and part rootin’ tootin’ Western. Although Chris Kyle was a real person, Clint Eastwood fictionalized version is one that adheres to the Western trope of masculinity – or a search there of. Straight off the bat, the audience is introduced to a man trying to fit himself into an outdated stereotype, Kyle sports the shirt with western detailing, boots and wide brim, white Stetson. Somewhat ironically, Eastwood uses the stereotypical Western signifiers to highlight Kyle’s lack of a definitive identity, his alienation and ultimately his emasculation. Kyle exists in a world that has corporatized the cowboy and his aspirations to become a rodeo rider leave him chewing the dust and with a girlfriend who cheats on him. American sniper works within the more classical Western framework and stays away from the intricacies of the socio-political complexities of the Iraq war, instead, focusing more on the dichotomy of good versus evil. The depiction of the enemy Kyle fights remain faceless, aligning the film with a trope central to the frontier mythology, the unquestioned savagery of an enemy and the necessity to destroy them. However, it is through Eastwood’s depiction of Chris Kyle’s internal struggle with morality, honour and duty and the ineptitude of his chain of command that the film also becomes revisionist. It suggests that the civilizing force – in this case the US Army and all it represents – may, in fact, be flawed. There is something to be said about how well the film did at the box office, grossing approximately US $ 350 within the US domestic market to date. A large part of modern American imagination is built on frontier mythology and has found popular success in its fictionalization through Westerns, whether they came in the form of dime novels or feature films. American Sniper transposes this mythology to a new frontier and dresses things a little differently.